O Holy Tabernacle! 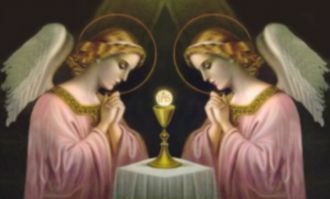 Thou dost enclose the precious Bread of heaven, the food of angels, the Eucharistic manna of the soul. My heart longs and signs for Thee, O good and gentle Jesus, Who art hidden in the Blessed Sacrament! Thou art my Lord, my God, and my all, and Thou wilt deign to come to me this day in holy communion. I thank Thee for all the graces I have received through the Holy Eucharist; I am sorry for having offended Thee; I love Thee now with all my heart. I wish to offer this holy communion in reparation for all the offences that have been committed against Thee in the sacrament of Thy love, and especially in atonement for my own sins and negligence’s. and I shall approach the Holy table today with the greatest confidence that thou, O Lord, wilt grant me all my requests.